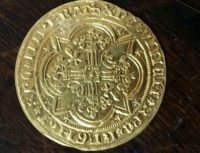 Today in every-history-nerd’s-childhood-fantasy-come-true news, a rare 14th century gold coin was found in the secret compartment of a modest George II-style modern bureau. Amy Clapp inherited a bureau from her great cousin last Christmas. She doesn’t remember ever having met him and she certainly knew nothing about his furnishings. It’s a 20th century piece, solidly made, attractive but nothing of great value. It has two wide drawers and two half-width ones in the front, and a bunch of small ones when the desk is open. She looked through all the drawers and cubbies before calling Hansons Auctioneers to have it appraised for sale. Furniture expert Edward Rycroft examined the piece to assess its value. He estimated it was worth about £80 ($106). Then he looked a little deeper and found three secret drawers. One of them held secret treasure. Much to his amazement, he discovered a 22ct gold coin hidden in a secret drawer. 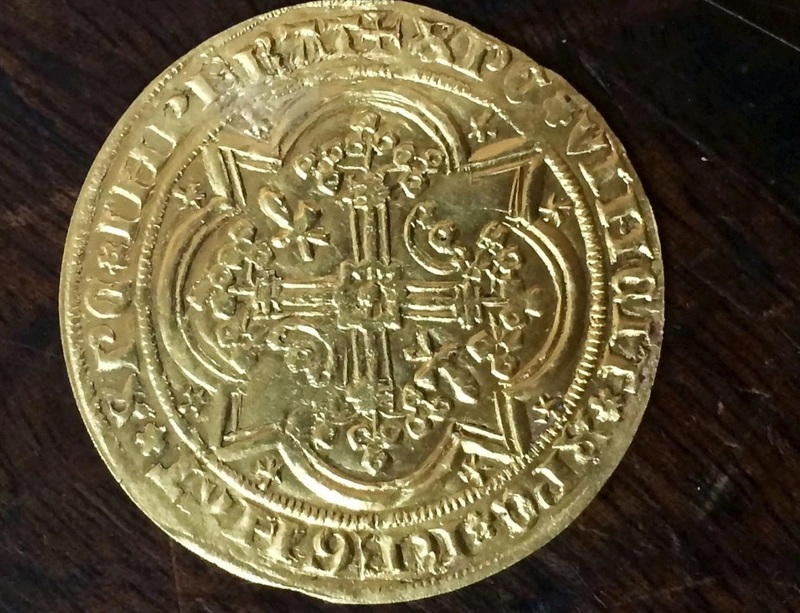 It turned out to be rare, more than 650 years old and highly valuable. The Raymond IV Prince of Orange Franc A Pied coin dates back to 1365. Its guide price is £1,200-£1,800 but the experts at Hansons think it could sell for as much as £3,000. According to their coin valuer Don Collins, it’s very unusual. In more than half a century of coin valuing he has never seen one exactly like it. Amy Clapp was thrilled by the unexpected windfall as her family has been through some hard times lately. Her daughter has a genetic condition, Bardet-Biedl syndrome, which has severely affected her sight. Mrs. Clapp works for the charitable organization Bardet-Biedl Syndrome UK and plans to donate some of the proceeds to the charity. Here’s hoping it sells way above estimate when it goes up for auction next month. The bureau goes under the hammer tomorrow. I’d buy it in a heartbeat for twice the price. God I love secret compartments. 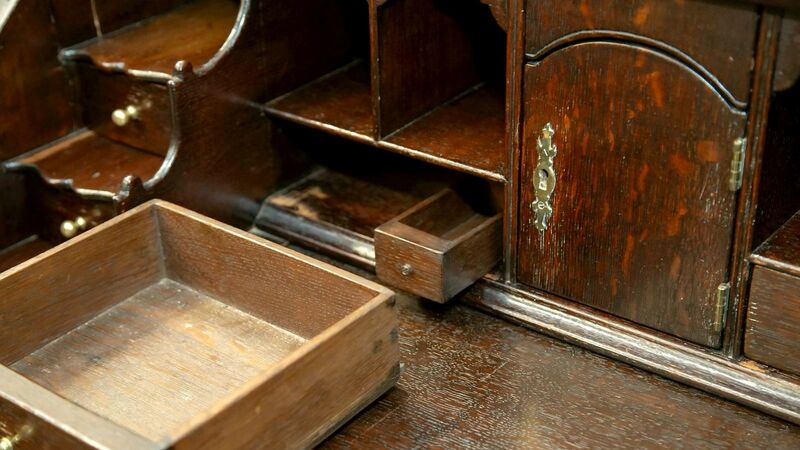 This video shows where the secret drawer was found in the desk. This entry was posted on Tuesday, March 19th, 2019 at 11:29 PM	and is filed under Modern(ish), Renaissance. You can follow any responses to this entry through the RSS 2.0 feed. You can skip to the end and leave a response. Pinging is currently not allowed. Maybe, I got confused about all the different ‘Raymonds’, but the one in question here (i.e. provided that the coin dates from 1365), is the chap that was ‘Prince of Orange’ as ‘Raymond V‘ from 1340–1393, and, also ‘Lord of Baux’ as ‘Raymond IV‘. Branduardi might come to mind (“Il Signore Di Baux”, 1979): “His house the lord of Baux, he built it on Rocks. Steps of a thousand knights mark his paths, at night watch from above , cold his thoughts…” –Of course, the castle mentioned here, is the one above Les Baux-de-Provence (Occitan: Lei Bauç de Provença). P.S. : There are plenty of versions, even one in French from 1980, but seemingly there was none whatsoever coined in Occitan. Thus, here a fresher and less turgid, less ‘1970ies’, production, and one from Barcelona. My customer ordered a Federal-style spice-box as a Christmas gift for his wife. Loving secret compartments, I built six into it, without his knowledge, and when it was finished and he came to pick it up I told him about them, “and I’m not telling you where any of them are.” Breaking into a huge grin, he took it home. Mid February his wife called, “I can’t find any of them”. Over the phone I walked her through the secrets, and she was screaming. The Furniture Market is SO OFF. Just try making a piece like that! 330.66 USD For shame. The hardware costs almost that much. That looks like something our king Willem might buy for his eldest daughter, the current Princess of Orange! That is awesome! What fun!